LANCASTER –Miguel Rauda was shopping for his family this past Friday, when a thief snatched Rauda’s bicycle from outside an East Lancaster grocery store. The bicycle was not recovered, and it was his only means of transportation to work, Rauda told the responding deputy. The responding deputy searched the Lancaster Sheriff’s Station resources in an attempt to locate a replacement bicycle. Fortunately, a very generous anonymous Lancaster business owner came forward and donated a bicycle. 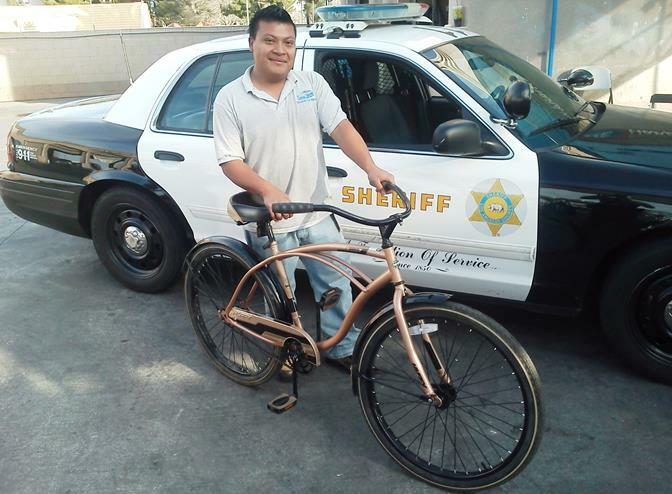 Rauda, 26, gratefully received the donated bicycle Saturday morning, said Lancaster Community Relations deputy Miguel T. Ruiz. The investigation continues for Rauda’s stolen bicycle. 5 comments for "Bicycle donated to theft victim"
great story! Its nice to hear about good deeds a deputy has done instead of all the negative we hear a lot of. But as I look at that bicycle I see one thing missing… A LOCK. Here in the AV its pretty much mandatory that you have a bike lock.. I hope he gets one so this does not happen again. Here’s hoping a lock is obtained. I agree locks are mandatory. This is an awesome story. I’m glad he got a new bike and I hope the thief gets hit by a car. OMG, Nancy P, you are awesome!